Vote Daily! Each vote helps One Peace become more visible, attracting more players! making us easier to find, and inspiring new generations of players to join and experience our amazing community! But we know April Votes bring these sweet rewards!! Reward yourself with God-Like Tools, Armor, Spawners and more! For however you choose to spend it! 6 Voter Keys, 12 Website Credits, and $600 of in game cash. 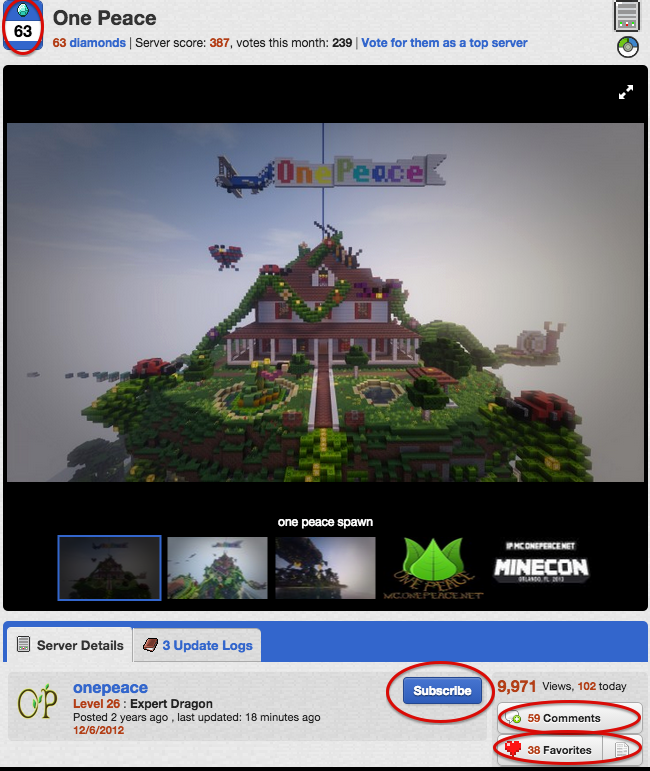 When voting on Planet Minecraft, please take a few minutes of your time to help us reach our goal of becoming Minecraft's number one family server! 5. Lastly, comment below and let people know how you feel about One Peace! April Voting Rewards are Updated! Good luck, and Happy Voting! Need FREE wood? /warp TreeFarm - Harvest and Re-Plant! Sell your things at the KatCraft shop! Look around for the [Sell] signs and earn extra cash! Merry Christmas and Happy Holiday everyone! Stay warm and eats lots of yummy food! Sorry I have not been active I have been so busy with school but I will return I promise! OnePeace 1.13 has arrived! Now's your chance to get on and create some brand-new memories! Any updates on 1.13 for the server? who is gunna be on 1.13 as await for modded? If you do not have a build transfer. will your personal inventory, including contents of shulker boxes, be transfered ? question: so technically all my builds can fit into an emerald block if they are positioned correctly, but as of rn i have 1 emerald field and 1 diamond. Would it be possible to take the build in the diamond field and the 2 builds in the emerald? Deadline for your applications is closing fast make sure your read the insrtuctions. imo, cold pizza is better than re-heated. Cold pizza yes or no? Who lets awsomaw inside the house? !